Eight months of dry heat has left plants struggling to produce fruit. 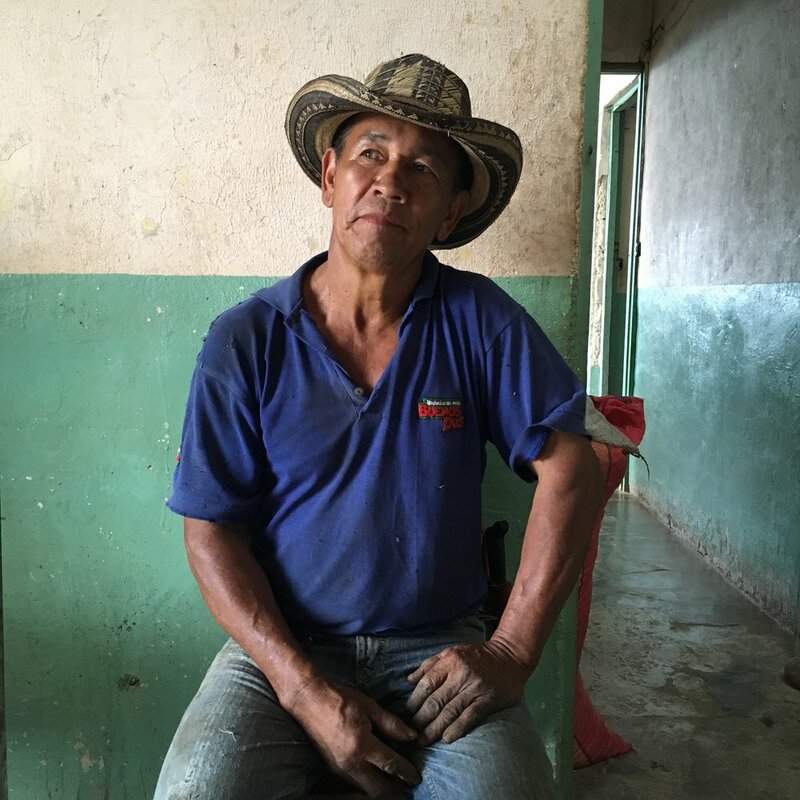 The farmer pictured above simply had no coffee production as of May, during the usual peak of harvest. Zero. Most of us are well aware that coffee is highly susceptible to climate change. During visits to pretty well all coffee producing countries, the evidence - signs and stories - are there for all of us to see and hear.During our recent travels to both Colombia and Brazil, the impacts of climate change were all around us. From Colombian producer stories of little to no (yes, zero) production during peak harvest, to decreased sugar content in cherries due to plants being impacted by severe rains in Brazil, it becomes increasingly obvious that in addition to having strong agronomic practices and great cup profiles, being a great coffee producer now also means being adaptable to climate change. First a brief background to the two weather phenomena we observed the effects of during our recent trip. Whereas El Niño is referring to the warming of tropical Pacific surface waters from near the International Date Line to the west coast of South America from November to March once every 3 to 7 years, La Niña is the cooling of sea surface temperatures and takes place roughly half as often as El Niño. While travelling throughout the countryside in Huila, Colombia our team learned that while there was a net increase in coffee production between July 2015 to July 2016, this figure says nothing of the devastation El Niño wreaked earlier this year. Many of the country's departments, in particular Huila, experienced both the worst drought conditions and some of the highest recorded temperatures in over 130 years. As described earlier, many farmers suffered through zero production moving into the peak of harvest. The lack of a harvest was caused by cherries not producing seeds due to the lack of rain and lead to a further serious consequence that many cherry picking labourers, who are paid by weight, simply refused to pick whatever was produced on the trees. For affected coffee farmers, the lack of picking causes even more future harm because the trees are then not prepared for the next harvest cycle. While El Niño causes dry and even drought like conditions, like the ones our Colombian partners faced, La Niña produces the opposite: excessively rainy/wet conditions. 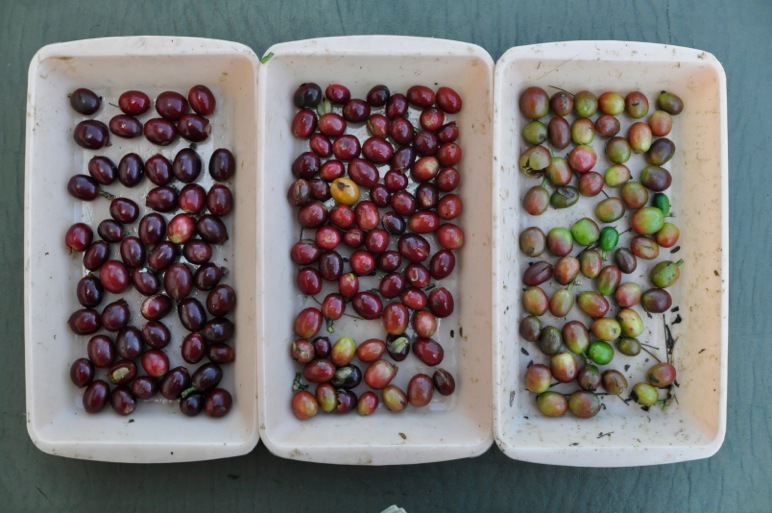 In the case of our partners in the Carmo de Minas region of Brazil, La Niña brought three times the amount of rain at the beginning of the season than normal and this caused not only damage to many of the cherries, but also a disproportionate number of defects due to the increased opportunities for bacteria to infect drying cherries on the branches of coffee trees. In Brazil, the heat is often so intense during the dry season, when coffee is harvested, that fruit begins to parch while its still on the branches. The results of all of this is evident in the cup, as many of the coffees we tasted had less sweetness and complexity than in previous years. The good news is that we were able to find and pick out the best of what was on offer. It just took more concentration during our screening and more samples to find these gems. From a farm perspective, our partners are fortunately well organized and have great practices and infrastructure in place. They can rely on some of their other farm activities to make up for coffee deficits from this harvest and are able to plan, adapt to and mitigate possible long-term effects from the weather conditions this year. It wasn't all bad news during the course of this trip. 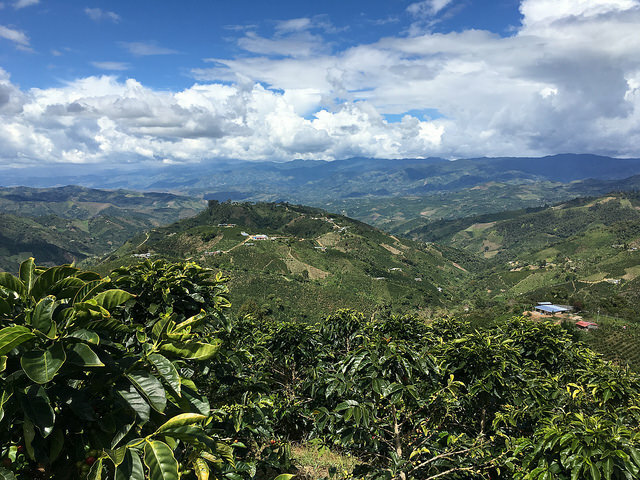 We are delighted to report that in Colombia, production has picked up due to increased and steady rain over the past couple of months. We have begun working with a new partner in the Acevedo, Huila region in Colombia that we will elaborate further on in the near future. In Brazil, our partners at Carmo Coffees are working on some incredibly interesting and potentially ground-breaking work on varieties and processing. We hope to offer some early showcases from this work in the coming arrivals and will keep you posted on how the coffees cup when we receive samples. Looking back just a few years in time, it is evident that the development of ‘Specialty Coffee’ as a term and as a mindset has changed how we perceive coffee, how we describe it (with flavor attributes), how we communicate about it (as product from a concrete place and person) and how it is traded (transparently). One may take these things for granted today. As we all should. Soon Colombia will celebrate its 10th year as member of the growing and still exclusive group of coffee producing countries that have been scrutinized and recognized by the Cup of Excellence (CoE) program. The program’s mission is to bring farmers to the forefront, by acknowledging both their existence and individually crafted products. Up until ten years ago ‘Colombian Coffee’ had been presented to the world by a very different marketing concept. As early as in 1958, the Colombian Federacion Nacional de Cafeteros (FNC) created Juan Valdez, a marketing mascot playing the role as a personification of the Colombian Coffee Farmer. ‘He’ is not only a fictive figure, but has represented FNC’s marketing concept which, quite tellingly, has been a presentation of the entire community of Colombian coffee farmers, meant to build a collective pride as a nation of coffee famers. And it has worked well for a long time. Colombian coffee had been marketed as a brand and as a blend, made collectively by the country’s half million coffee farmers, and managed to build a worldwide reputation for its quality. It had fame and recognition and became a staple on every roaster’s menu. CoE’s concept of bringing farmers individually and personally into the light and onto the stage, which at the time was a new idea, didn’t fit perfectly well with how Colombian coffee had been marketed by the FNC in the past. With the CoE competition in 2005, this was literally the first - and ultimate - test of what Colombian Coffee really was about. 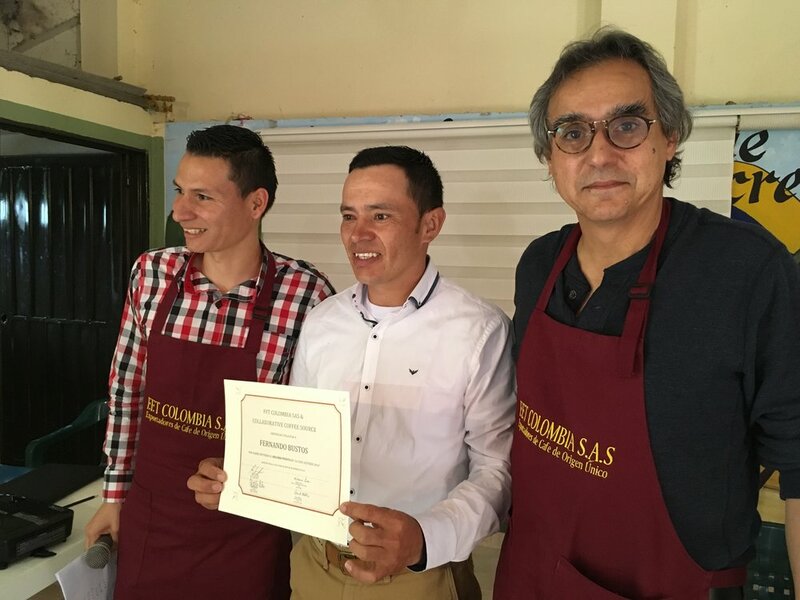 Since the average production at a coffee farm in Colombia is much less than the CoE program’s minimum submission requirement of 12 bags, farmers were allowed to form groups with coffee from up to three farms constituting a CoE competition-lot. Despite this stipulation, samples representing over 800 lots were submitted to FNC’s center in Manizales that first year, where the national CoE jury first pre-screened the samples based on technical quality and then began the comprehensive cupping/further screening and re-cupping processes of the remaining 150+ samples. Of these, the international jury were presented with 60+ of the best samples and given the task of cupping and scoring them all over again. The CoE international jury’s mandate is to screen the national jury’s selection further in order to find the very best lots (at the time those who scored an average of 84pts or more), and then ranking these top coffees, as well as describing each coffee’s attributes. Many of the well-known personalities, new and old in the coffee trade, were on that jury, including the gracious Grand Lady of Specialty Coffee, Erna Knudsen. As a matter of fact, it was she who coined the term Specialty Coffee almost thirty years prior to this event. 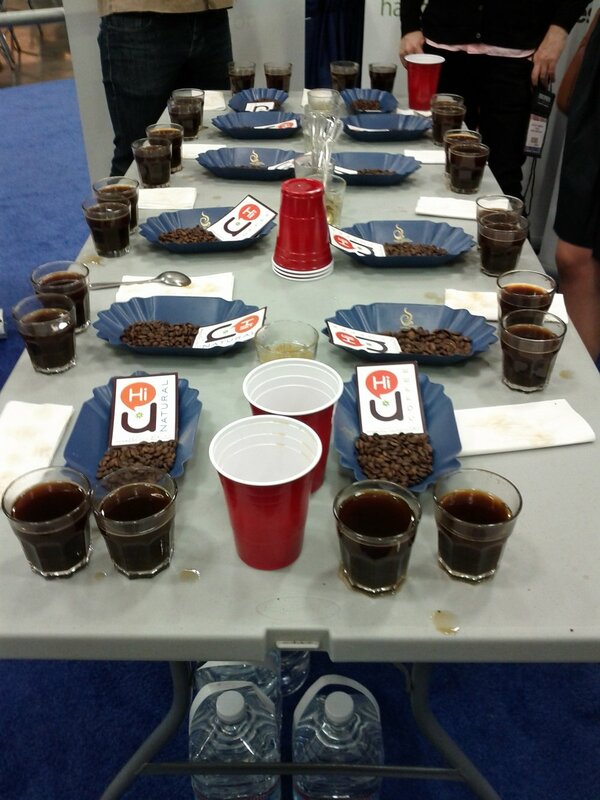 During the course of two weeks, all the samples from the submitted lots were cupped five times, but even with all that, on the final table, when ranking the top 10 coffees on the final day of the competition, samples were rejected for phenolic off-flavors, a defect that is usually related to issues with the processing of the coffee cherries. Hey, Juan Valdez, what was going on?! 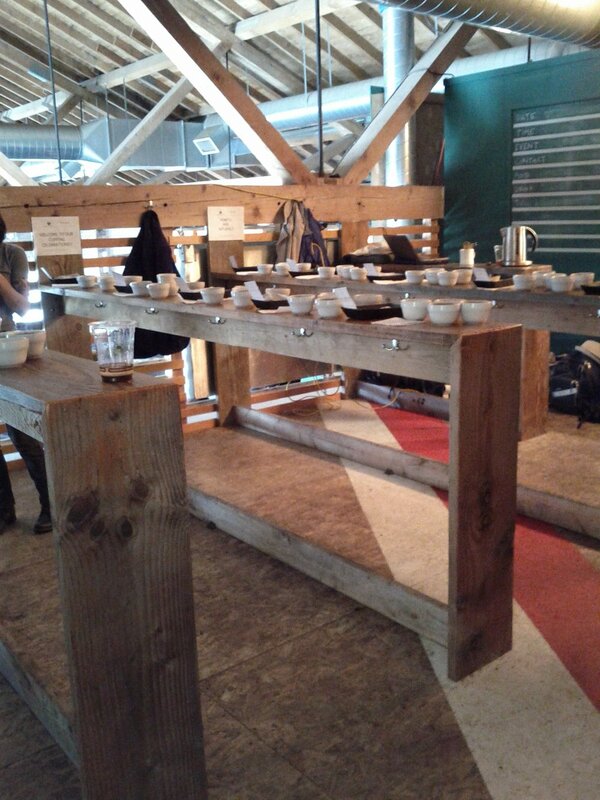 In the end, the remaining top coffees were fantastic and all the farmers’ names were revealed. The winners received their standing ovations and sold their coffees at the auction at record prices. Regions and microclimates were discovered. A new era began. Still, this was also a time for reflection on how to approach the seemingly endemic processing issue that had thrown so many coffees out of the competition. Meanwhile, another kind of problem had been threatening the Colombian coffee tree population for a long while. Coffee Leaf Rust, La Roya, is such a long-standing phenomenon that Colombians commonly use it as a slang term for something that ‘takes with it whatever comes in its way’: La Roya se lo llevó. Coffee farmers have had to struggle with climate and climate changes that have created environments where fungi that can kill coffee trees leaves are able to flourish. The traditional ‘Colombia Varietal’, a Catimor hybrid, was designed to be Leaf Rust resistant, whereas the Caturra varietal became known to be more susceptible to it, yet many farmers have been able to work out Roya-threats proactively. Coffee is a cash crop; it is handled as any other cash crop, like soy, maize, beans, bananas, etc. Coffee farming in Colombia is usually a rather non-technical enterprise, often times with little planning, thus no calculations for concrete outcomes. With little control over harvest outcome, revenue, and cost control, one becomes vulnerable to unexpected problems and market price volatilities. Coffee farming is often times a losing proposition. Being on top of the game requires more than just will. Taking care of a farm, particularly with the ever-present risk of a Roya-attack, is labor intensive and costly. Cleaning weeds, pruning trees, fertilizing, and in order to maintain sound trees is key, particularly when there is an environmental threat lurking. A healthy tree is generally less susceptible to diseases like Roya. If proactive spraying is necessary, usually done with copper, this is an extra cost to already expensive regular operations. One of the results of all of this is that the concept of investing in a coffee farm and keeping healthy coffee trees isn’t necessarily a viable path from an economic perspective - considering the level at which coffee is usually paid for. So when fertilizers and fungicides are needed, a vicious cycle of borrowing money before the upcoming harvest can easily develop. When you don't own the revenue for your own coffee harvest until all debt has been paid off (sometimes at exploitative high interest rates) it becomes tempting to not spend extra money on the farm. For Colombia, as a coffee producing country, this kind of vicious cycle has been even bigger. When millions of trees lost their leaves, partly due to insufficiently attentive farming practices or plain negligence, many farms lost entire harvests, meaning Colombia as a nation lost a lot of revenue. The FNC went on the hunt for solutions! This is when the Castillo varietal, a modern version of the Colombia (Catimor) varietal, was developed and pushed for by the FNC. Castillo was cleverly designed as 11 different types, meant to be ‘site specific’ to particular geography, environmental and climatic conditions around the country. But the FNC not only encouraged farmers to exchange the Roya-susceptible Caturras into Castillo; Castillo was made a requisite variety, meaning it became eligible for subsidies and credits from the government. Castillo has its benefits. It can be planted more densely (higher yield per hectare), the trees are shorter (easier to access for cherry pickers), and it produces more even cherry ripening than other varietals (making the harvest season shorter). Though whether Castillo continues to be resistant to Roya, or other fungi, in the future is as yet to be seen. Coffee farming may not prove to be that simple. The good news for Colombia is that tanking production levels and a record low of 7 million bags is now turning around. Production levels are back at 11 million bags; approximately where they were ten years ago. In the meantime, the country has transformed itself into a ‘Castillo-origin’ making the other varietals (Caturra, Bourbon, Typica, Tabi, etc.) more difficult to find. Begging the question: How smart is this, when a growing market is asking for diversity and specialty quality? And this is all political. Of course it is! As a nation, for which the GDP is dependent on coffee, the market price level matters. Colombia is not merely a coffee supplier; the ‘market’ is not merely asking for supply. - Specialty Coffee (sold at a negotiated price based on quality assessments, including cup attributes). With this backdrop and based on recent visits, my next article will look into what is happening in the field of Specialty Coffee in Colombia right now. As an important aside, the Cup of Excellence program celebrates its 100th competition this fall. 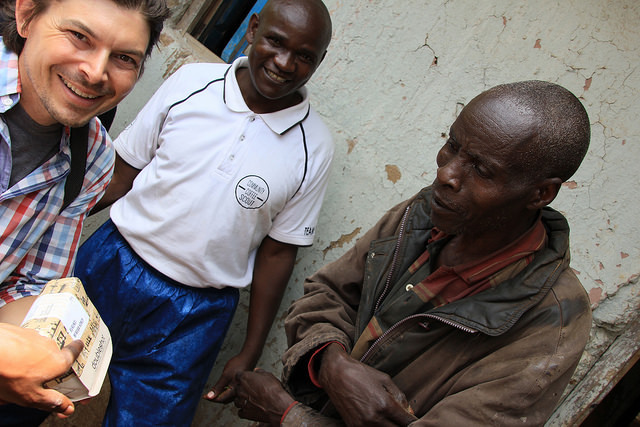 Susie Spindler, the program’s director for many years has chosen to step down, thus we should take a moment to reflect on her formidable and significant contribution; building CoE’s credibility by holding firmly to it’s protocol, which has helped to define Specialty Coffee as we know it today. CoE, under Susie’s tenure, has helped create an understanding of the individual origins it has been present in since the program’s inception in Brazil, 1999. Looking back at a hundreds of years of coffee history, this understanding has developed a long way in a very short time. Thank You Susie! *In the case of Specialty Coffee we are seeing a drive toward taking charge of the production by ‘designing quality’ for specific markets. With so many Colombian farms being re-planted with the Castillo Varietal, the question becomes if the Country is able to meet the demand of an increasingly growing Specialty Coffee market. The Herrera brothers come from a traditional coffee-growing family but studied engineering abroad in the 70s before returning to Colombia in 1998 in order to reconstruct their grandfather’s hacienda and to begin coffee growing. Cerro Azul is one of several farms owned by the Herreras. 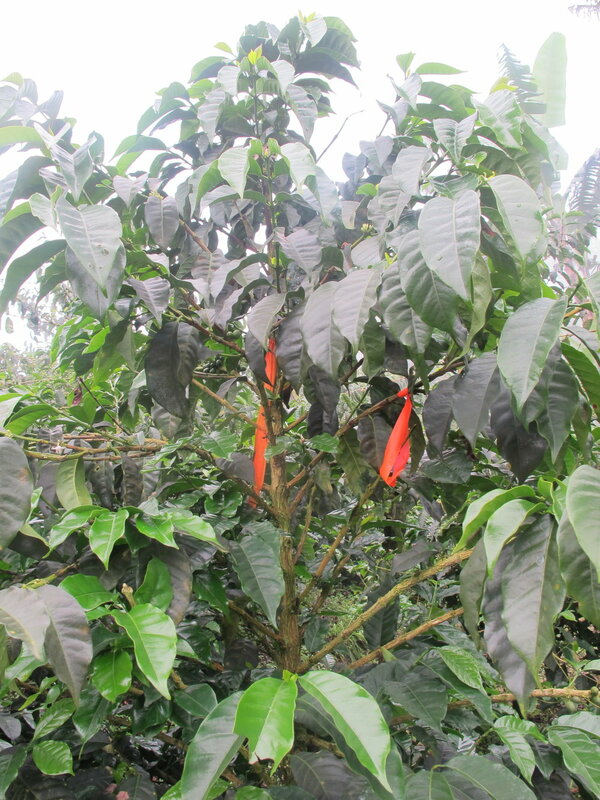 Based on the growing conditions at Cerro Azul, the Herreras chose to grow geisha. This location boasts ideal altitude, climate (especially night temperatures), soil composition, access to light, amongst several other attributes, that contribute to excellent growing conditions for this varietal. The farm is separated by a hill: one side with foggy and cloudy conditions, the other, more sunny and clear. These differences lead to two different growing conditions, as well as differences in the cup. One interesting thing to note about the elevation in this region is that at 1600 masl, a tree yields 900g of parchment, while at 1850 masl, 280g of parchment is produced. 500 of the best trees are marked for replanting and the cherries harvested go directly to the nursery. There are two sub-species of geisha: bronze tipped and green tipped. These sub-species are mixed amongst the 17 lots. The seeds for the trees at Cerro Azul come from one of the Herreras’ farms in Panama and the first were planted in September of 2007. La Esperanza is the processing facility for Cerro Azul and it also manages two other geisha farms. 40% of the coffee is harvested and processed between January to June; 60% from July to December. It's been a busy, eventful and educational last few weeks at the Collaborative with our jurying at Best of Panama, participating at both the Specialty Coffee Association of America's (SCAA) annual event in Portland and Omar Viveros' and Giancarlo Ghiretti's visit from Colombia. With everything said and done, it's now time for us to communicate with you all about these happenings because much work has been done over these last weeks to establish relationships, build upon existing ones and to learn more about how specific partners are contributing to this community of quality-focused coffee professionals. When we talk about partners we are not only referring to original cherry producers or end coffee buyers/roasters. There are many people along the way that contribute skills, knowledge and equipment to the green coffee a roaster receives. The number of partners that contribute depend on many things: geography, the particular skillset of a farm owner and the equipment/facilities available on his/her farm, how a miller and/or exporter works with both producers and the coffee, etc., etc. So while the work done on the initial product, from agricultural practice to picking, is of utmost importance, the work done after picking up until the coffee is delivered is almost, if not just, as important. Thus it isn't enough to have great relationships with just cherry producers or coffee farm owners; a coffee buyer must be able to trust those milling and exporting coffee. Right now we are buying from approximately eight coffee producing countries and are looking to reestablish buying relationships in one or two more. Within these eight countries, we are buying coffee from a minimum of 70 individual cherry producers. So even if we have the chance to visit each and every one of these partners in a given season, it is not possible to get all the work done in those short visits as is necessary to establishing and maintaining meaningful contact. The regular contact and work done with each of these producers is one of the many reasons our exporting partners at origin need to be acknowledged. I had the privilege of meeting the majority of our export partners at this year's SCAA event in Portland. I've "met" and worked with them a lot over the last few months through email but nothing replaces face-to-face contact. I learned much from these meetings and conversations, amongst which were: 1. A bit of context about the producing region each exporter works within; 2. How each exporting partner works with and views the relationship between cherry producer and exporter; and 3. Where they would like to see the industry go and how they plan on innovating and growing within their own region and context to see through this vision. In some cases we were able to talk about more but these were the most significant parts of the conversation for me, as a communicator and facilitator between/amongst partners throughout the coffee chain. Robert has been working with these partners for several years and has assessed the work and merits of them. This made it easier for me to just talk with them about the current season and to begin planning for the next. All of us are excited - many ideas flew about during those four days. Now that we're all back home, it's time to work on these ideas. The work has already tangibly begun with our partners in Colombia. Omar Viveros is a cherry producer who we've been buying coffee from with the help of Virmax, our exporting partners in Colombia, over the last two years. He is a producer who works hard, is innovative, is becoming a model for neighbouring producers and simply produces clean, excellent coffee. Virmax work with the most quality-focused coffee producers in Colombia and even amongst these dedicated producers, Omar stands out. A few days after SCAA ended, Omar and Giancarlo Ghiretti, one of Virmax's founders, travelled to Oslo to lecture at Kaffefestivalen (the annual Norwegian coffee show) in Haugesund and so Omar could meet some of his end customers and see how his coffee is brewed in coffeebars in Norway. Omar's visit was educational for everyone who participated. For us at the Collaborative, a lot was learned about what it takes to produce excellent coffee in Pitalito. 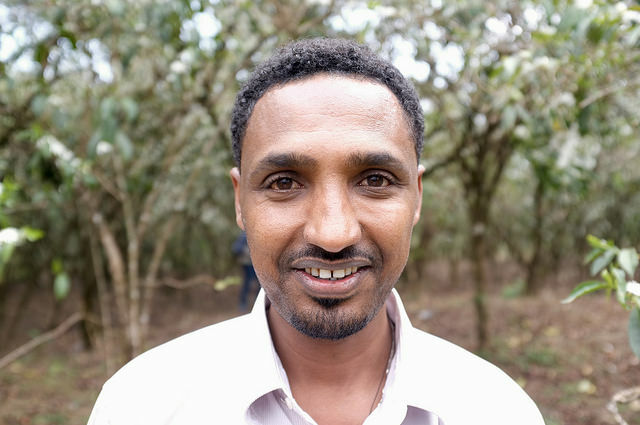 For Omar, it was inspirational and instructive to see how the many things he chooses to do on his farm have an impact on how the final consumer experiences his coffee. He also had the chance to see what is done in between, during the roasting process, at KAFFA. He pays his pickers well and provides bonuses in order to keep them. Once a good picker is found - someone who understands what a ripe cherry looks like and consistently picks ripe cherries - you don't want to let that person migrate elsewhere. The common practice in Colombia is to allow cherry to dry ferment for 18-hours before it is depulped and sent for delivery. Omar has found, through experimentation, that soaking cherry in water for 24-hours provides much better temperature stability, which allows for a more even fermentation process. Omar's drying facility is constructed so that some areas have more or less shade, so that coffee can be rotated at specific times, for an optimal drying process. Omar is constantly looking for new ways of doing things to improve quality. He follows through on the advice of Virmax's agronomists and is a member and participates in a growers' association that provides education and training. As a result of educating himself, experimenting and listening, Omar has learned that certain varieties cup better, thus receive higher scores and prices, than others. Currently his farm is half made up of the Caturra variety and the other half is made up of the Colombia and Castillo varieties. The Colombian government promotes and encourages the planting of Colombia and Castillo because they are "hardier" plants. But (without getting into a long debate about it) Caturra cups better. We'll leave it at that for now because not enough is understood/known about this topic for us to make statements about the whys and hows of this. We will write more about Omar's visit. He and Giancarlo lectured at both Kaffefestivalen and at KAFFA about what it takes to be a great coffee producer in Pitalito. When we described the work we do to Omar, he wanted to find ways that he can engage more. One of his ideas is to livestream activities on his farm, so we'll be working on how to do that over the coming weeks. This month, we receive shipments from Kenya, Brazil and Guatemala. We are cupping in Gothenburg today and are arranging cuppings in other locations, which are yet to be determined. If you would like to be involved/would like to attend a cupping, or you're part of a group of roasters wanting to work with us and would like to cup as a group, email Per or me. We are very happy and proud to announce that Omar Viveros will be in Norway this week and next to speak about his experiences as a coffee producer in Colombia. He will present at both the Norwegian Coffee Festival & National Barista Competition in Haugesund and at KAFFA roastery and lab in Oslo. 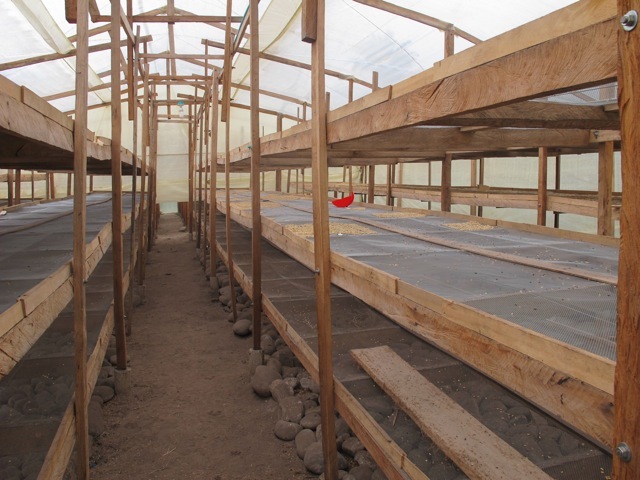 Omar's farm is located in the village of Pitalito, near San Augustine in the far south of the Huila region. Coffee producers in this region enjoy great growing conditions and produce high quality coffee but changing weather patterns are becoming more and more challenging for producers each year. During the past few years in particular, producers have experienced unpredictable rain patterns (e.g. rain during typically dry periods), which has led to the damaging of coffee bushes and subsequently made it difficult to dry beans evenly. Omar is, however, both an ambitious and conscientious producer and has found ways of working within these challenges. He understands that in order to receive a higher price for his coffee, good cupping scores (i.e. 86+ points) are required. In order to achieve these scores and prices, he must consider many things: plant species (in Omar's region, caturra produces the best quality), sound agricultural practices, careful picking and processing and good drying systems, amongst many other things. Omar’s lots show his understanding of these practices; his coffee is exceptionally clean and fresh compared with other lots in this region. The first lecture takes place on April 26th at 1pm at the coffee festival and barista competition in Haugesund and at 5pm at KAFFA roasterty and lab on May 2nd. Hope you can make it! Hector Artunduaga is married to Maria Yanit Sanchez and they have 2 children: Hector Mario and Laura Camila. Hector and Omar Viveros (another Collaborative partner) are neighbours. 50% of the farm is planted with coffee and the rest is a native forest that he does not want to cut. La Esperanza also produces plantain and yuca mainly for family consumption. Hector produces about 12,000 kg of dry parchment per year, equivalent to about 120 bags of green per year. 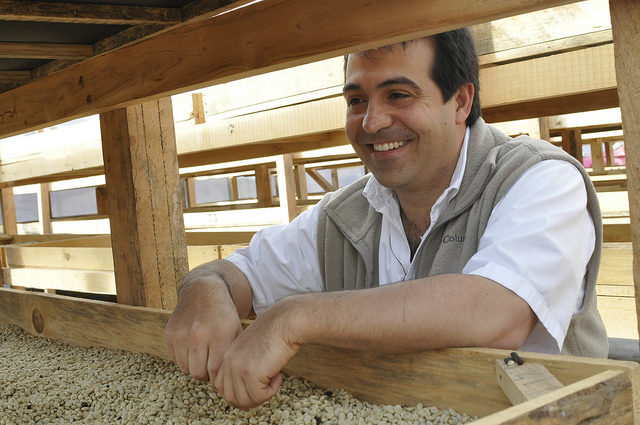 In addition to coffee producing, Hector has studied and holds a bachelors degree in Economics. Farm geography/description: 1,700 masl. The entire farm is relatively flat. 322 hectares, of which 281 is dedicated to the cultivation of coffee. History and Overview: The owner of the farm is Oswaldo Acevedo. 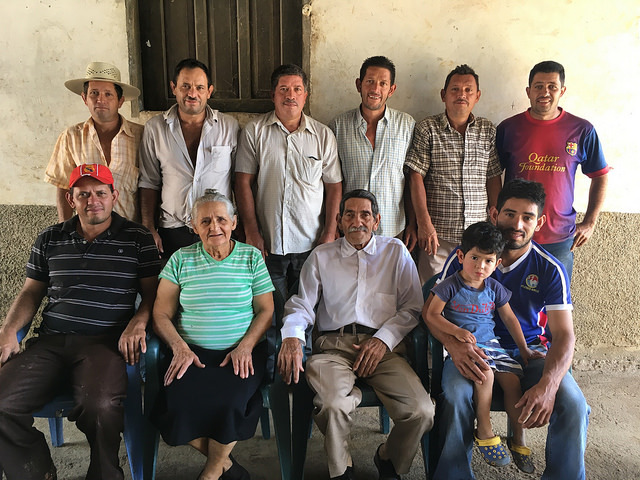 Oswaldo and his cousins inherited El Roble from their uncle but Oswaldo bought out his cousins in 1995. Coffee has been cultivated on this land since 1976 and Monica Fuentes, who is now manager, has worked at Roble for more than two years. In the last few years, El Roble has really begun to focus on the quality of the coffee with much help from Virmax. Varietals are now separated, as well as day lots. Every lot is cupped; this year alone Virmax has cupped about 400 lots/samples. Virmax have also initiated training programs for pickers, so there is more of a focus on picking for quality. All parchment is stored in grainpro to protect from outside moisture and humidity, as well as for general protection. Output: Normally, El Roble produces 5000 bags of coffee per annum, but in the last few years they have averaged about 2000 bags because they are renovating (i.e. they are pruning and replanting), leading to a lower output. Harvest/Season: From October to December; one crop per year. Processing: Depulping, dry fermenting approx. 18 hours, washed and then sundried. Certifications: Smithsonian Bird Friendly, USDA Organic, JAS Organic and Rainforest Alliance. Description: El Roble is a fantastically beautiful farm, located two hours away from Bucaramanga, in Santander, northern Colombia. One of the most special things about this farm is its canopy of shade trees. Like an enormous roof, this canopy covers the entire farm. The ecology on this farm is diverse with many different animals living on the farm. Thanks to reforestation processes, the management have found new water sources and the organic farming practices combined with the shade canopy have contributed to creating a home for several types of animals, including 125 identified bird species. The farm's water sources include five lakes and two creeks/rivers. El Roble planted an experimental coffee garden with 72 varietals. This garden has provided the possibility to plant new varietals on the farm, for example, Mocca and Geisha (HR-61 and HR-62). The garden also provides the opportunity to see how different trees react to a specific climate and terroir. Emma is 57 and she is married to Juan Bautista Pichica. They have 3 children (Nelson, Javier and Jonny) and two of them help out with the farm work. 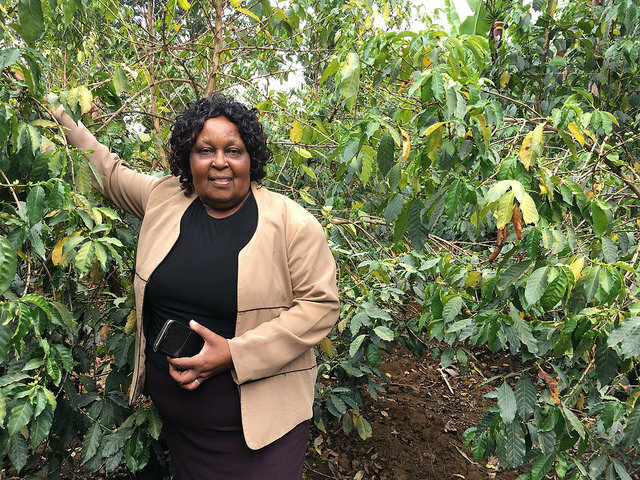 Emma has been working in coffee for 30 years and the coffee is picked by Emma herself, as well as her family and they try to only pick ripe cherries. Aside from coffee they also produce sugar cane, plantain and yuca, which they use for their own consumption.